Little sisters pretending their father is a pelican; a man achieving “a gawky grace” while asleep in a public library; a woman stepping past a sprinkler in a confined space “like an Andalusian horse/ dancing”; a traveller weeping uncomforted in a café in Sydney; an aboriginal man playing a didgeridoo in prison; a son praying for his mother in her pain; a random spray from a damaged hose watering a wild daisy; a rainbow enfolding the fuselage of an aeroplane “like a promise”: these are a few of the many surprising, moving things depicted in this collection of poems by Andrew Lansdown. Far from Home abounds with warmth, insight, quirkiness and compassion. The poems explore and express loss, grief, longing, regret, hope and happiness. They celebrate family, friendship, freedom and courage. They affirm the astonishing value of human life and are informed by an integrity that arises from the poet’s Christian faith. Readers, however, do not need to share his faith in order to appreciate his poems. These are poems of the human condition; and as such, they speak to every human heart. and when he went he drew us there. this place he knows we cannot share. that none survive except by grace. Don’t go, beloved! Oh, beware! upon that place we cannot share! that gave him passage to that place. It barely counts how much we care. laying me away with hurt. a pup in the prison. it. Who now can work? with a pup at her heels! it with a hard urgency. Four years and six to go. This book contains such a wealth of stunning poems. Being a fan of Andrew Lansdown’s work over many years, some of the poems in this book are already familiar to me from other publications. Boat in particular is one of my favourites and one I have often used in poetry writing workshops to demonstrate how poem to can be constructed on more than one level. While it is about a boy going out to sea in a boat, it is also about the way the relationship between father and son changes as the boy grows older. Grief and I Do not Forget are poignant poems that will resonate with others. Others present a fresh view in small imagistic poems that make the reader look at things differently. Haiku and tanka are two favourite forms Andrew Lansdown uses and he packs so much into so few lines. No-one writing in Australia, in my opinion, handles imagery as deftly as Lansdown. His poetry is exquisite. Some of the other poems, in particular those about the prophet Elijah were new to me. They take the biblical story and give a fresh perspective to it. I was so engrossed in this new perspective on Elijah’s story that I was disappointed when I came to the end and found it had the left the reader at the point where Obadiah meets up with Elijah before his encounter with Ahab. I would have liked to keep reading more of Elijah’s story in this manner. Maybe that’s for another book. For anyone not familiar with Lansdown’s work this would be a good volume to acquaint them with the breadth of Landsown’s poetry and the imagistic, lyrical and spiritual qualities always found in his poems. For those who already know his work this is another gem to add to their collection. He has always been able to convey his Christian faith and poetry in a way that even readers and poets who do not share his beliefs can recognise and appreciate the artistry and lyricism of his poetry. 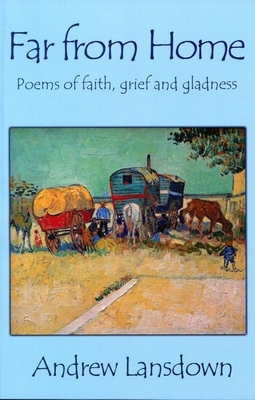 The cover shows a replica of The Caravans— Gypsy Camp by Vincent Van Gogh; an appropriate image given that Lansdown himself is so obviously on a journey to his real home in heaven. Even his simplest imagist poems display his faith in a living creator who wants the best for His children. Like all the books produced byWombat Books this book is beautifully presented – a delight to the eye as well as to the ear. After reading it initially, this book is one I have returned to time after time to dip into. to the part that’s not matter. It dies quickly, lies lightly like an autumn leaf. Lansdown is a keen observer of life and a master of metaphor and simile. His poems about family life show his deep love for his wife and children and his spiritual poems show a depth and thoughtfulness that draw the reader in. The book concludes with a 32-poem suite inspired by the Biblical record of the Prophet Elijah. I found the sequence dealing with the widow of Zarephath and her son particularly moving. As the poems change from the point of view of Elijah, the widow and her son, I found myself thinking about the story in new ways. It’s amazing how much the poet was able to glean from three chapters of scripture. The poems end before Elijah’s confrontation with the prophets of Baal, which made me wonder if there are more poems in the works. Not only is this a fine collection of poetry, but it’s also beautifully presented and would make a wonderful gift. A book to dip into again and again.